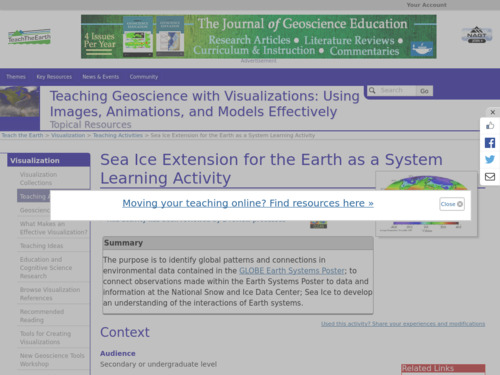 Activity focuses on 2007 sea ice minimum, so teacher will need to update activity with data from the National Snow and Ice Data Center http://nsidc.org/arcticseaicenews/ or other sources. Requires a substantial amount of teacher preparation to ensure students don't get lost in the material. Install required software on school computers prior to doing activity to save time. Data-rich activity that pulls from a number of different sources. Will need good preparation to ensure students don't get lost in materials. This activity combines two other activities that have also been reviewed for the CLEAN collection and provides an extension to those activities. Data in activity is for 2007, but concepts still apply as do skills developed by activity; data sources links provided so instructor could easily update the activity to current data. Comments from expert scientist: Conveys how solar energy varies with latitude and by season, shows albedo affects how much solar energy gets absorbed. Uses sea ice as an example to show changes in the surface can dramatically change the amount of absorbed energy. Resource based on assumption of a cloud-free environment. Involves visualizations and spreadsheet data manipulation. Data modeling and output make this activity interesting to students. Activity extensions and follow-ups are suggested in Word handout. Assessment suggestions are general, and educators may need to develop appropriate strategies. Hand-out materials give detailed instructions to students and are easy to follow. A basic knowledge of Microsoft Excel will help students.